Littlest Sweetheart Baby doll. The moment you walk into the room, your baby girl’s eyes light up, and you feel her excited energy. Now, let this realistic little one be first in your heart: the Littlest Sweetheart Baby doll, a heartwarming So Truly Real® Collector’s Edition doll by renowned Master Doll Artist Ping Lau, exclusively from The Ashton-Drake Galleries. Bursting with realistic charm, this lifelike baby doll is simply precious from head to toe! 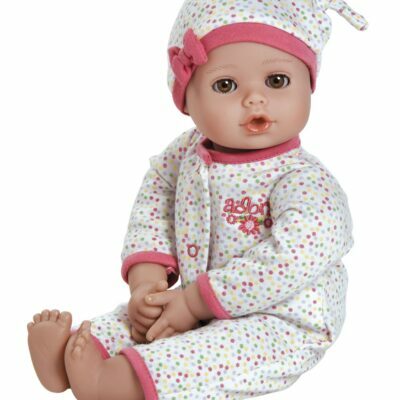 Sporting an adorable pink and white polka dot bubble ensemble with a darling row of hearts across her chest, this sweet So Truly Real® baby doll is handcrafted of RealTouch® vinyl, perfectly capturing every detail of Ping Lau’s original sculpting. She’s poseable and weighted to feel so lifelike in your arms. From her hand-painted real-looking features to her soft, hand-applied hair and big blue eyes, this precious baby doll is sure to win everyone over! The moment you walk into the room, your baby girl’s eyes light up, and you feel her excited energy. Now, let this realistic little one be first in your heart: the Littlest Sweetheart Baby doll, a heartwarming So Truly Real® Collector’s Edition doll by renowned Master Doll Artist Ping Lau, exclusively from The Ashton-Drake Galleries. 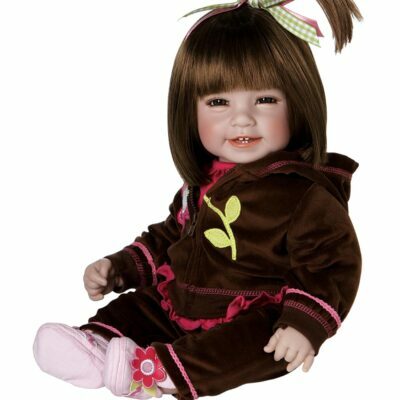 Bursting with realistic charm, this lifelike baby doll is simply precious from head to toe! Thank you she is just adorable in person.